Handline 935 Gravenstein Hwy. S., Sebastopol. 707.827.3744. 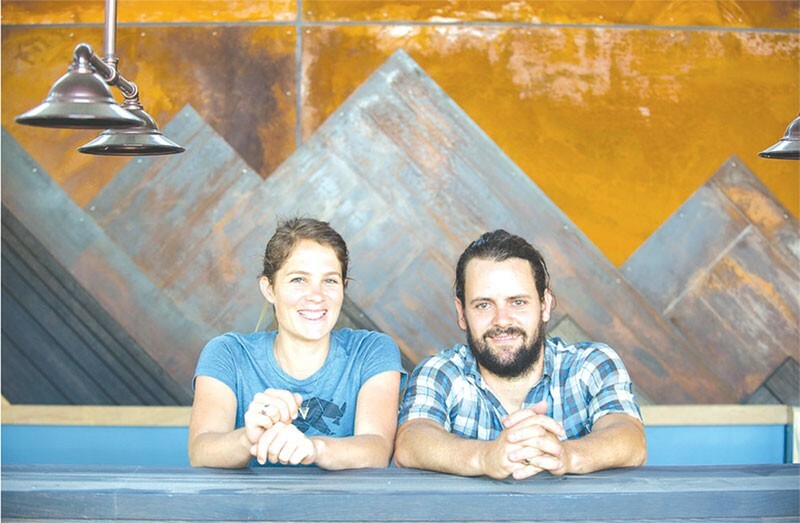 TAKE THE BAIT tHandline is Natalie Goble and Lowell Sheldon's second restaurant. It's a hit. I'm a fan of Peter Lowell's restaurant and when I learned owners Lowell Sheldon and Natalie Goble were opening a more casual fish taco and burger spot in the old Foster's Freeze across town I couldn't wait. The concept is "coastal California"—ceviche, fish tacos, cioppino, oysters, farm fresh salads, and artfully prepared burgers all washed down with exceptionally good beer and wine. Handline is easily the best looking restaurant in the West County. The idea was to echo the mid-century aesthetic of Foster's Freeze and they've done that but much more. Inside the ceilings are high and light pours in. The roofline and street sign are reminiscent of the old burger joint. The wave-like wood patterns on the walls, the big, sliding rice paper-like panels and the beautiful outdoor patio with long, high-style picnic tables add a Japan-meets-California indoor-outdoor feel. One of the most distinctive features of the restaurant is the fencing—heavy gauge wire frames filled with asphalt removed from the site. The monolithic structures serve as a sound and visual barrier to the busy Gravenstein Highway and are a tangible example of the owners' commitment to reuse and recycle. I ate my way through a good portion of the menu and everything I tried was good, some great. I love fish tacos and am a stickler for technique, having eaten many a taco in San Felipe and Ensenada. Handline's were delicious and generous. Ten bucks gets you two, heaped with lightly battered rock cod under a hillock of lime slaw squirted with chipotle aioli. My only quibble would be all that cabbage reduced the crunch of the fish, a pleasing textural contrast that makes fish tacos so satisfying. Don't miss the al pastor tacos ($12). They're as good as any I've had north or south of the border. The succulent, spit-roasted pork plays off bits of porkified pineapple and piquant pickled onions. Impressively, Handline mills the corn for its masa and makes the tortillas to order. No one does that, except Sonoma's excellent El Molino Central, where Goble got a master class on masa. Sheldon and Goble said they wanted to satisfy fans of Foster's Freeze with a good burger. At $11 it doesn't classify as a fast food price, but their burger is a great value. The pasture raised beef is topped with tangy St. Jorge cheese sauce, spicy sweet Calabrian pepper relish and thousand island dressing sandwiches between an outstanding toasted, brioche-like bun Goble makes herself. There's also a fish sandwich ($14) and a housemade vegan burger ($11). Handline does an elegant version of cioppino—the Pier 45 ($17). It's loaded with clams, mussels, fish and calamari that swim in a thin, but rich tomato broth. The handsome bar and eclectic selection of beer and wine will make it a destination in its own right. I predict kids will love the place, too. The kids menu includes a downsized burger ($9), fish and chips ($9) a quesadilla made with more of that St. Jorge cheese ($6) and Mi Niño—chicken, beans, avocado and cheese ($8). And they'll love the crazy under-the-sea terrarium filled with neon-colored coral and jelly fishes, Aquaman, Godzilla, Barbie dolls, turtles, squids, crab and more doo-dads and figurines that come into view the longer you look. What's for dessert? Soft-serve Straus ice cream, chocolate, vanilla or swirled ($4.50). Reel me in. I'm hooked.